Take your time. Grieving and feeling the pain of a suicide loss is natural and an important and necessary part of finding relief. There is no timetable for the grieving process – it is different for everyone – but it will take time, sometimes years. Be patient with yourself and allow the process to unfold naturally. Trying to ignore it or block it out may only make it worse in the long run. Ask for help. In the early days following a loss you will likely be numb and overwhelmed emotionally. Funeral arrangements, dealing with the police and other practical problems caused by the suicide can be extremely stressful and exhausting. You will not feel like doing everyday tasks such as cooking, shopping, walking the dog or doing laundry. Friends or family will want to help but may not know how. Let them know what support you need – especially if you have children or other dependents. Take care of yourself. It is important to take care of yourself physically, emotionally and spiritually. Getting enough sleep, eating regularly and healthily, meditating, walking or some form of exercise, can help relieve some of the stress and anxiety of grief. Others find relief through their faith, art, music or writing. Avoid excessive drinking or drug use – it will likely increase feelings of anxiety and depression. Above all, remember this is a gradual process and you will have bad days when your grief feels as painful as ever. Take it one day at a time and don’t be afraid to ask for professional help and advice from your doctor or a counsellor if you need it. Express your emotions. Grief is an emotional rollercoaster. It’s normal and OK to cry - even years after a loss – not a sign of weakness. Make time for your grief – especially if you are trying to care for other family members who are grieving - and let people know when you need support. You don’t need to be “strong” or put on “a brave front”. It’s good to talk. Do not grieve alone. The support of others is a critical part of healing and sharing your grief – whether with friends, family, doctor, counsellor or pastor - can help. It is important that you feel listened to without worrying about people’s reactions or feeling that you are being judged. This is why talking to others who have experienced a suicide loss is particularly helpful. Join a support group like LOSS or an online group (see Resources ). Take the good with the bad. Immediately after a suicide you may think that you will never laugh again. You may feel guilty about enjoying yourself. But watching a movie or a game can provide a welcome mental break from the stress of grief. It does not mean you love or miss the person who has died any less and such feelings will lessen over time. Try to make the most of the “good” days – they will help you get through the days when you feel low. For many survivors, occasions such as Christmas, the person’s birthday or anniversary of their death can be difficult. However, anticipating the event can often be harder than the day itself. It’s a good idea to communicate with friends and family about the event in advance and how they can be supportive. You may want to be with people and talk about your loved one or you may just want to spend the day alone and grieve in private. If you are not comfortable about going to an event, it’s okay to say no. If an event becomes too much for you, take a break and go for a short walk. Having an exit strategy to leave early if you need to can reduce any anxiety you may feel beforehand. Some survivors find that taking a trip and having a change of scenery helps. Some find comfort in keeping family holiday traditions; others find them too painful and start new ones. There is no right or wrong way to handle these occasions and sometimes a date or event that worried you one year may not the next, and vice versa. Simply do the best you can and be gentle with yourself. People may find it difficult to know what to say to you and often resort to clichés that are unintentionally painful for a suicide survivor. “Time is a healer”, “They are in better place”, “These things happen for a reason”, “Be thankful for what you still have”, “You have to be strong” are common well-meaning phrases but which survivors can find empty and extremely hurtful. Some comments may also be made from a strong religious belief that perhaps you do not share. Even if you have a strong religious background, you may be questioning your faith following such a traumatic loss and the comments may seem particularly insensitive. Try not to let them bother you. If you can, let people know that sometimes it's OK to say nothing and that a heartfelt hug means far more than words. 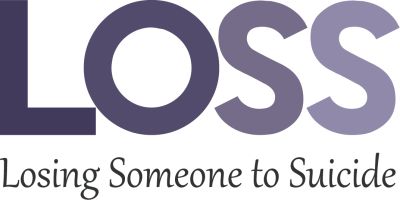 Please note that LOSS is a volunteer support group for those bereaved by suicide, not survivors of suicide attempts or those considering suicide. If you have attempted or are considering suicide, please seek professional help or call the Mid-Atlantic Wellness Institute’s (MWI) 24-hour Helpline at 236-3770. If you or someone you know is in a mental health crisis you can walk into MWI for immediate help, Monday to Friday, 8am to 5pm. Evenings, weekends and public holidays, call the MWI Helpline at 236-3770 or go to the Emergency Department at the King Edward VII Memorial Hospital. If you are with someone who you believe may have attempted suicide, call 911 immediately.